Woohoo! 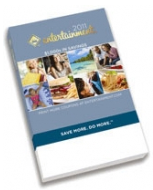 Yet another great deal on the 2011 Entertainment book. You can score them for $7.49 each after cash back. They are priced at BOGO Free at $19.99 for 2 books. Plus shipping of $1 per book. Then you can get 35% Cash Back through Ebates. Get 35% cash back (on the $19.99 price) in your Ebates Account. FYI: For those that are interested in the ShopRite coupons, they do have the ShopRite coupons in the North Jersey/Essex, Morris County and South Jersey additions. There are 2 – $5 off $50 coupons that you will still be available to use. One coupon is good through 7/30/11 and the other is good from 7/31 – 10/29/11. Printable Coupon Round Up As Of 5/25!